Lawn mowers may have small engines, but they can be dangerous. 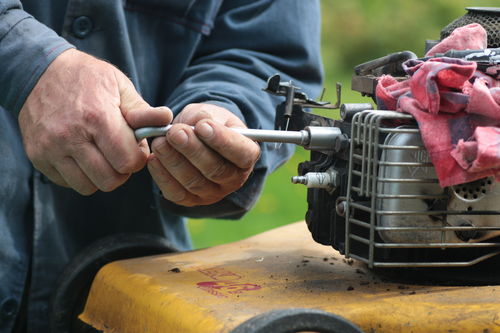 If it needs to be fixed, don’t risk getting hurt by attempting lawn mower repair on your own. Even if you are handy in other respects, small engine repair is best left to the experts at K N Small Engine & Rental Equipment. Working in Lancaster, WI, the seasoned local professionals fix garden equipment, power tools, and more, so you can get back to caring for your property safely and effectively. Proper Tools & Equipment: When you have the wrong or sub-par tools for a job, you won’t be able to perform the repair effectively. Professional lawn mower repair contractors, on the other hand, use the best tools and stock extra lawn mower parts. Being this well-equipped allows them to complete small engine repairs correctly and on-time. Deadly Blades: Even dull blades can be deadly. If your lawn mower’s performance has been declining, and you suspect dulled blades are the issue, have K N Small Engine & Rental Equipment sharpen or replace them. They have the experience and skills to quickly perform lawn mower sharpening while mitigating the dangers. Small Engine Complexity: Many lawn mowers are powered by internal combustion engines, and troubleshooting their systems is a hard-earned skill. You might not have the knowledge to find the exact problem or perform a solution. A professional lawn mower repair person can competently examine the machine and determine the source of the issue. Whether it’s because of bad fuel, engine clogs, dead batteries, corroded spark plugs, or another issue, they can find the problem and fix it. If you need lawn mower repair, trust no one less than a professional. K N Small Engine & Rental Equipment is glad to be at your service. To request a quote, call the Lancaster, WI-based lawn mower service at (608) 723-3790. Visit them online for details about their services.